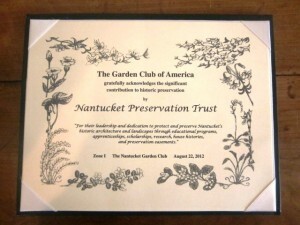 On Wednesday, August 22, 2012 the Nantucket Preservation Trust was honored at the Nantucket Garden Club’s Annual Meeting with a Garden Club of America Award for its “significant contribution to historic preservation” and for its “leadership and dedication to protect and preserve Nantucket’s historic architecture and landscapes through educational programs, apprenticeships, scholarships, research, house histories, and preservation easements.” We are truly honored to receive this award and also salute the Nantucket Garden Club for its many years of work to educate about the island’s natural and man-made landscape as well as its tremendous outreach to the Nantucket community. 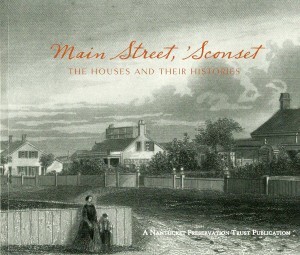 Main Street, ‘Sconset book – now for sale! This summer NPT published a new neighborhood book entitled Main Street, ’Sconset: The Houses and Their Histories, written by Betsy Tyler with contributions by Michael May. The book filled with nearly 100 photographs, including historic images of the houses and the early owners as well as 19th century maps of the village, highlights the development of and architecture along this main road into the village The 96 page book is available for $30 (inc S&H). Click here to buy online. 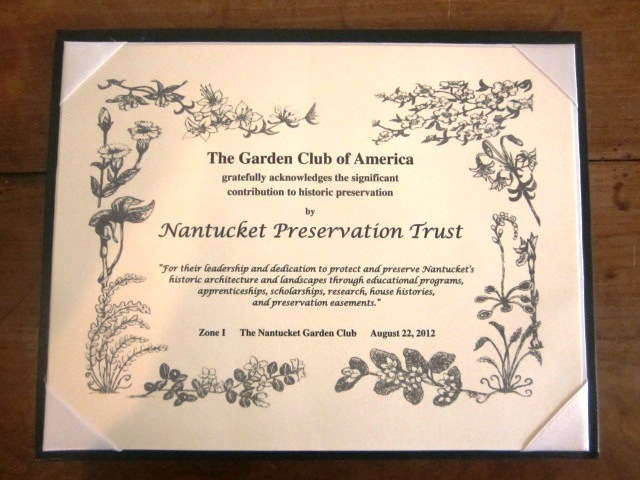 This year the Nantucket Preservation Trust is celebrating its 15th anniversary as the leading advocate for the preservation and protection of Nantucket’s architectural heritage. Over the years we have strived to develop programs that explore the architecture and history of the island’s buildings, and that increase awareness of the importance and fragility of these resources. NPT’s growth and success are the direct result of our many supporters including; the 100-plus volunteers who selflessly devote their time and talents; property owners who graciously open their homes for our events; individuals and businesses who participated in our marketplace, auctions and publications; corporate sponsors of NPT events; our non-profit partners; the dedicated membership; and the 1,000-plus attendees to this year’s summer programs. We are deeply indebted to all of you and especially those who assisted us with this year’s activities and programs. Each of you, in your own way, is helping to protect the island’s unique collection of historic buildings and special places. Thank you so much for your service and commitment to Nantucket’s incredible architectural heritage.